Easily assembled no tools required. 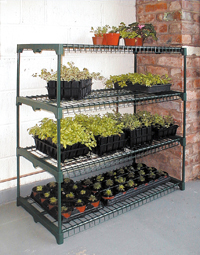 Versatile shelving for the greenhouse etc., Wide freestanding unit, which can be built in sections giving 2 to 4 shelves. Built up to 3 shelves high gives you the ideal potting bench. Fully assembled gives you plenty of room for 16 seed trays. 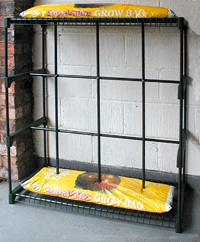 Shelves can also be removed giving more flexibility for those taller plants and makes a great growing frame. 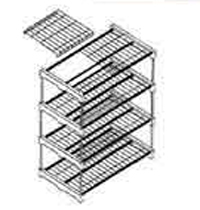 Close mesh polyester coated wire shelves will hold many small plant pots, and allow very good air circulation. Depth 50cm/20" Width 100cm/39" Height 110cm/43"
Depth 50cm/20" Width 100cm/39" Height 76cm/30"
BUY TWO GA130 & SAVE £8!